Gordon Campbell has a very bad reputation for not telling the truth, in fact he is a habitual teller of very tall tales. The Premier’s statement in the following article, ” But you know the operating costs of the SkyTrain are about 50 per cent a year less than with light rail. And the ridership is two and a half times greater with SkyTrain.” is a complete falsehood! A 1996 comparison with Calgary’s C-Train LRT shows that the Expo Line costs 40% more to operate than Calgary’s LRT (both about the same length), yet the C-Train carries more passengers! 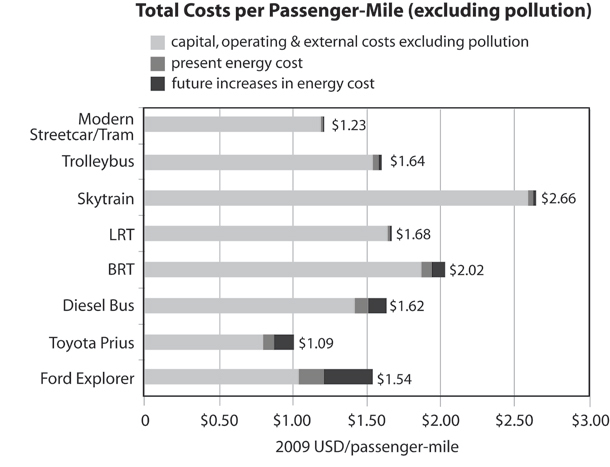 Operating costs, Calgary C-Train (2006). A 2009 study done by UBC Professor Patrick Condon also showed SkyTrain as being very expensive to operate and in his study, SkyTrain had the highest cost to operate than any other transit mode in the study, which reflects much higher operating costs. There is no independent study that shows that SkyTrain attracts more ridership than LRT, in fact at-grade/on-street light rail tends to be very good for attracting ridership. There are other erroneous claims being made in the article and they will be dealt with later. 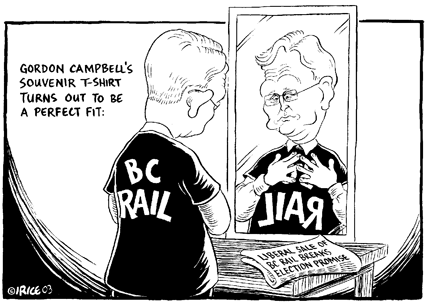 Mr. Campbell demeans himself with such claims, as he continues to demonstrate that truth is not in his lexicon. SkyTrain was built and will be built for reasons of political prestige and not what is best for the transit customer or the taxpayer. 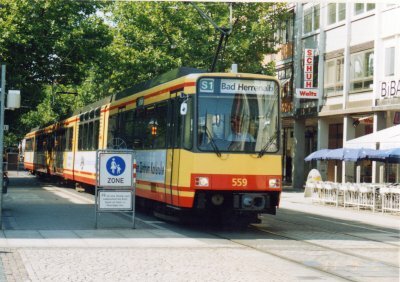 SkyTrain has failed to find a market domestically,in the USA and in Europe because it is both more expensive to build and more expensive to operate than its chief competitor modern LRT. Mr. Campbell, Rail for the Valley demands honest debate for the future of transit in the region, not your half baked statements based on fiction, to pursue your political aims. “Oh, what tangled webs we weave, when we first practice to deceive“, Mr. Campbell, your tangled web of anti-LRT propaganda stops here, next time, deal in fact. SkyTrain detractors should consider the benefits of the technology and not focus solely on the lower cost of building new rapid transit lines with at-grade light rail, Premier Gordon Campbell said. “It does cost less in capital – it costs about $150 million less,” the premier said in an interview with Black Press, referring to price estimates for the Evergreen Line to Coquitlam. The decision to make the Evergreen Line a SkyTrain extension rather than a separate light rail line will ultimately move more people, faster at lower long-term costs, he predicted. Campbell spoke Thursday, two days after the release of a new study from advocates who say a 100-kilometre light rail line from Surrey to Chilliwack can be opened on existing railway tracks for less than $500 million, compared to $1.4 billion for the 11-kilometre Evergreen Line. 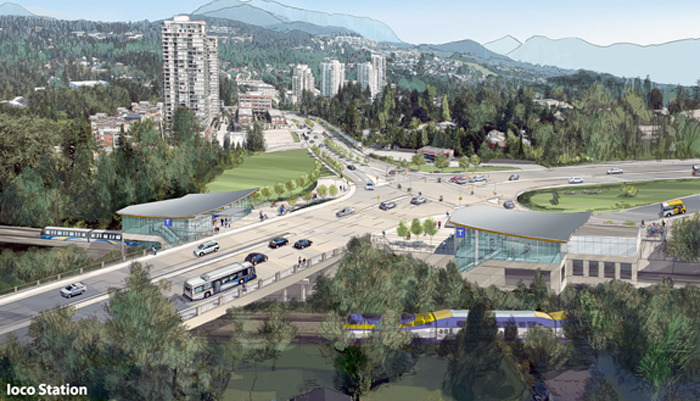 Several mayors, including Surrey’s Dianne Watts, have lobbied for light rail for future lines. Also critical to any transit expansion in the Lower Mainland, the premier said, is to ensure cities concentrate growth along transit corridors to support use of new lines while also making neighbourhoods more livable for walking and cycling. Campbell signed an accord with Metro Vancouver mayors Sept. 23 promising to explore a multitude of methods to raise more cash for transit expansion. He said mayors are free to put on the table even contentious options like a vehicle levy or forms of road pricing, which the agreement notes can help shape how people choose to travel. But he cautioned the key is to deliver good transit services that work and not merely try to use tolls or other fees to deter driving. Asked about public concern over the potential tolling of all three Fraser River bridges out of Surrey, Campbell downplayed the issue, saying the province determined in advance residents supported tolling the new Port Mann Bridge to deliver congestion relief. “There’s always going to be someone who says ‘I don’t want to do it,'” he said, but cited the time savings for users of the Golden Ears Bridge. He said an “adult conversation” is required on the options to fund TransLink for the future. Other parts of B.C. need transportation upgrades too, he said, adding the province will be hesitant about steering money to TransLink that deepens B.C.’s deficit or makes it harder to fund health care. Rail for the Valley in the News! The Rail for the Valley/Leewood TramTrain study has had region wide reporting, with most of the weekly papers featuring this historic news release. Even the Richmond Review and south Delta Leader has Jeff Nagel’s article! Connector 2000 Association developer and operator of the Greenville Southern Connector tollroad filed for bankruptcy today in US Bankuptcy Court in nearby Spartanburg, South Carolina. The filing done under chapter 9 of the US Bankruptcy code that handles broke government entities has been expected for some time. The Association defaulted on debt service in January. Moves in the state legislature to bail out the lenders went nowhere. “The debtor is insolvent” their lawyers say bluntly in the Ch 9 filing. $500m was borrowed. 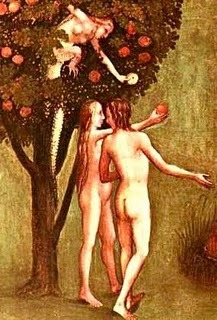 Equity was zero of course because the 6320 form allows no equity. Traffic has remained between a third and a half of that forecast by WSA when the association launched the tollroad project in this small South Carolina town in the late 1990s. Revenue has been even lower and is now under a third of WSA $s. The highway on the southern/southwestern fringe of the city only made sense as an access and development road. The road is too indirect to provide any time savings for long-distance traffic which has stuck to the free interstates. To provide an alternate to I-85 it needed to cross the Saluda River in its western portion to provide a much straighter shot easterly for traffic from Atlanta. It was designed however as an access road to local commercial developments – most of which never happened. A semi-belt route, 2×2 lanes and 16 miles, 26km long the Southern Connector tollroad gained interstate designation I-185 – totally unwarranted. Tolls for 2-axle vehicles are $1.00 cash, 75c transponder and 50c at the ramp plazas which are unattended. Tractor trailers pay $3.00/$2.25 sat the mainline plazas and 50c at the ramps. Trouble is for most trips through the Greenville area the main drag untolled I-85 remains much more direct and quicker. And even for east-west trips traversing the Greenville area to points south the old I-85/I-385 combination was quicker than transiting I-185. It swings too far out. The pike failed also because it was conceived as catering to continued development of Greenville as a light industrial and warehousing hub on the Atlanta-Charlotte corridor in the mid-1990s, just when that particular bubble was bursting. Most of the land on either side of the Connector remains undeveloped. Revenues are running at barely $5.5m/yr and toll transactions 12.5k/day. Tolls are taken at two mainline and two pairs of ramp toll plazas along the road so vehicles on the road are substantially less than the transaction number. 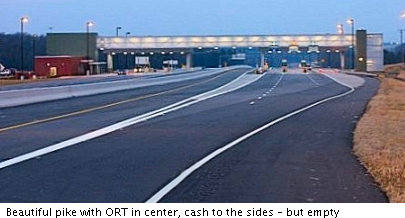 The mainline plazas have two lanes of open road electronic tolling and two or three cash lanes alongside each direction – state of the art for the time. 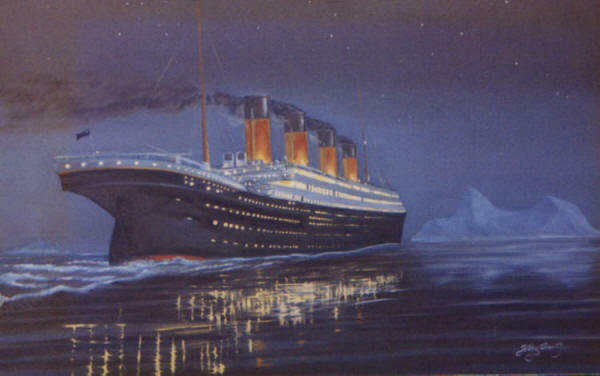 The last annual financial report available is for 2008. The road opened Feb 27, 2001. First tolls were collected March 13, 2001. It continues in operation using toll revenues to pay for operational expenses. Traffic at 12k or so vehicles/day would barely justify a 2-lane signalized road, let alone a 4-lane expressway. No equity investment is involved since this was one of a bunch of not-for-profits that were all the rage as “innovative finance” in the 1990s. They got a special tax advantage and were called 6320s after the tax exemption clause that treated them as a kind of charity. All these unsound no-skin-in-the-game ventures have now crashed. They were championed by a former federal highway administrator Bob Faris, a former VDOT commissioner Jim Atwell and other prominent officials who came to believe their own salesmanship. ARTBA the DC lobby group were cheerleaders. And they were eagerly embraced by a road development crew – a motley crew of consultants, engineering firms, financiers and construction firms – who made their money in the development, design and construction and had no interest in the viability of the roads as ongoing businesses. The Greenville Southern Connector was ill-conceived as an interstate standard expressway. Designers, engineers, lawyers, consultants and construction companies made their money in the development and construction and left the resulting mess to Connector 2000 Association a phony public-private entity without any real owners. So much for “innovative finance” as touted by ARTBA and other DC lobby groups. Lehman Bros NY which collapsed in Sept 2008 was the principal promoter of Southern Connector bonds. In BC and Canada, there is little money for railways to improve passenger service, yet there are billions of dollars for new highways and bridges. The sad fact is, in BC and Canada new highways and bridges win votes, while the railways are considered a ‘yesterdays’ transit mode. 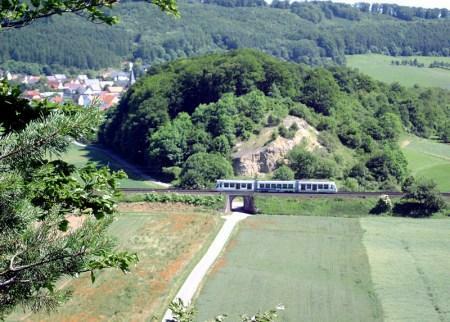 Just $500 million would buy us a Vancouver to Chilliwack interurban. 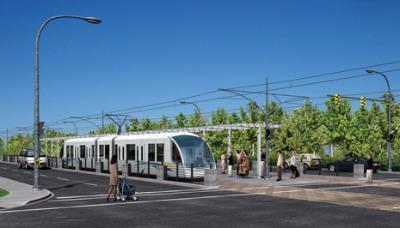 The federal government will spend $590 million in stimulus money to improve rail travel times from Blaine to Portland. The money represents the Northwest’s piece of an $8 billion stimulus package for high-speed rail, to be announced Thursday in Florida by President Obama. Only two-thirds of passenger trains run on time on the 3 ½-hour trip between Seattle and Portland, and the state is trying to boost that number to 90 percent. A series of small projects throughout Western Washington — some but not all of which the stimulus money would pay for — would save an estimated 833 hours of delays annually, according to the state. Ridership peaked in 2008 with 775,000 riders. “Anybody who travels the I-5 corridor in our state knows that we need to find new, efficient options to get commuters and commerce moving. And anybody interested in boosting our state’s economy knows that now is a great time to take action,” said a statement from Sen. Patty Murray, D-Wash.
Murray, chairwoman of the Senate Transportation Appropriations Committee, has talked at least four times with Transportation Secretary Ray LaHood about funding the Pacific Northwest Cascades corridor — stressing that rail could reduce congestion on nearby Interstate 5, a spokesman for the senator said Wednesday. Thirteen high-speed-rail lines serving 31 states will receive money, including $8 million for Oregon to improve trackways and Portland’s Union Station. 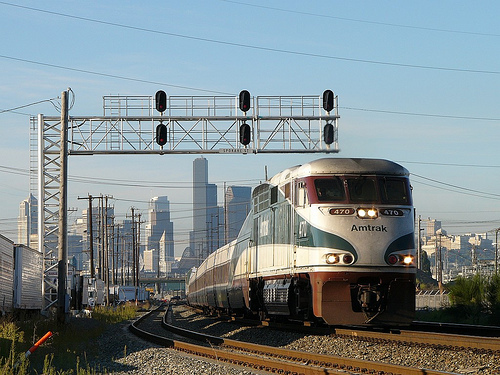 Five round-trip Amtrak trains run between Seattle and Portland each day. Only two go between Seattle and Vancouver, B.C., so buses fill out the route. Delays caused by freight-train traffic, and various accidents or obstructions, are common. Washington state had sought $1.3 billion to fund 26 rail projects from border to border, to prepare for eventually running eight round-trip trains to Oregon. Several projects already include at least partial funding from state tax increases in the 2000s. The federal stimulus money is devoted mainly to corridors of 100 to 600 miles, in hopes the trains become fast enough to substitute for airplane and car travel. In the Cascades corridor from Blaine to Eugene, the long-term goal is speeds in the 90 mph to 120 mph range, said the administration’s national rail plan, published last year. Years ago, Washington and Oregon purchased Talgo trains capable of 125 mph, because of advanced suspension systems that lean into curves. 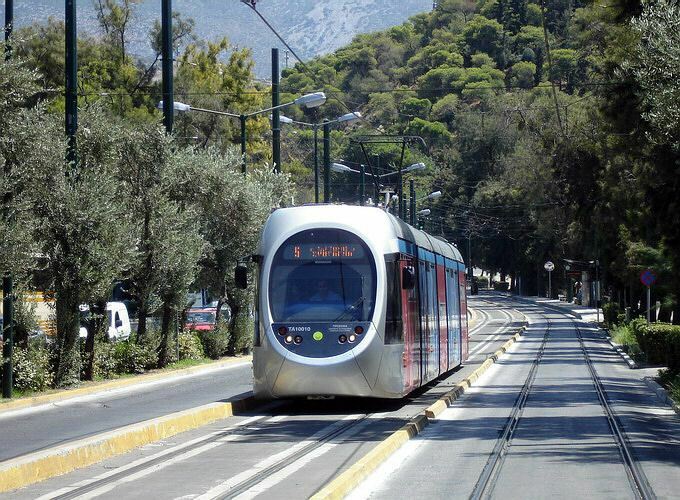 But they are constrained to 79 mph because of congestion, street crossings and flaws in the trackways. • Blaine: a siding track where freight trains can be inspected at the Canadian border without blocking passenger trains. • Blaine to Everett: reconstruction of tracks, ties and ballast to improve ride quality. • Seattle King Street Station: seismic retrofits. • Kelso: a new siding track where grain trains entering the nearby Port of Kalama can wait without obstructing the mainline. • Vancouver, Wash.: bypass tracks to avoid a large freight yard, moving passenger trains through 2 ½ times faster. The $8 billion in federal spending is only a fraction of last year’s $787 billion stimulus plan, and several regions have rail desires that far exceed the stimulus money. For instance, California voters in 2008 approved $10 billion in bonds toward a $45 billion bullet train from the Bay Area and Sacramento to Los Angeles and San Diego, to be a public-private partnership. This week’s award adds $2.25 billion, leaving a huge gap. California had asked for twice that much stimulus, arguing that its project is the only one aspiring to world-class, 220 mph train speeds. Florida is getting $1.3 billion to start a line between Tampa and Orlando that is supposed to reach 168 mph, a White House project list says. The administration will add $1 billion for each of the next five years, calling that money “a down payment to jump start the program,” said a statement, which notes that the interstate highway system took four decades to complete. Charlie Smith has another good article in the Georgia Straight about transit and transportation in the region and of course the comments are well worth a read. The January 16 meeting will take place from 1 to 4 p.m. at the Sundance Banquet Hall (6574 Ladner Trunk Road). It’s served by the C76 and C87 buses. January 18, TransLink is hosting a stakeholder meeting from 6 to 9 p.m. on a proposed rapid-transit line to UBC. It will take place at the Plaza 500 Hotel at 500 West 12th Avenue.